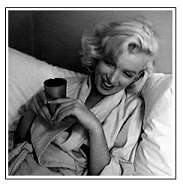 I may tend to ramble... remember, it's just the Coffee Talking again. Over the past 20 years, I've held memberships in both Sam's Club and Costco. We relocated to our current home just over a year ago and found our local Sam's Club to be acceptable. Sam's is only 10 minutes from our home while the nearest Costco is about 35 minutes away and in a very congested, poorly designed part of the city with heavy traffic and frequent car accidents in that area. Since I was happy with Sam's, I didn't bother to renew my Costco membership... until last weekend. Our local Sam's produce has steadily declined over the past 6-8 months and it's often clogged with boxes and stocking, aisles blocked off for forklifts during the busiest part of the shopping day (on a weekend no less!) and are many times low on stocking, have employees that don't bother to even say 'excuse me' as they shove past you and basically.... is going down fast. I decided to visit the Costco in the nearest city and see if it was worth renewing. It was. Barely. Not up to par with the rest of the Costco's in the country but... I digress. My point I guess, is that I don't prefer Sam's or Costco over each other, I hold memberships in both and that this weekend I finally decided to visit Costco in this area and see if it would be worth my membership fee to renew. It was borderline, but due in part to their tire department and their auto buying services, I decided to renew. And since I needed more k-cups for my Keurig brewer, I decided to purchase coffee at the same time I renewed my card. I like bold coffee. Hot, strong, black and bold. However, I'm also not going to pay $.68 - $1.00 per k-cup so I look for the best price and I'm willing to try new brands to see how they stack up. For that reason, I saw the Kirkland brand coffee at Costco and decided to try it as it was 100 count for $38 verses $39 for 54 cups of the brand I would have preferred. The only coffee blend my local Costco had in stock was the Kirkland Breakfast Blend K-Cups, 100 Count . Since I often brew my cups at the 6 oz or 8 oz size, the lighter brew is sometimes 'fine' and being it was in my budget for the day, I tried it. My review for this coffee will be rather short as there isn't much to say about it. It's a good coffee blend... if you prefer your coffee light and sweet. I placed the cup in the brew basket and hit the 8 oz. size (the middle button). While the first shot of coffee coming out of the brewer was a nice 'coffee' color, I was surprised to see the second 4 oz. was almost clear. Very watery. First sip, I didn't care for it. But I knew I was just 'used to' my other blends and had to give it a fair shot. Sipping the Breakfast Blend, it is indeed a bit sweet, and very light. Now, 'light' to me almost has a lemony taste. I would honestly say this coffee is very, very light. Very lemony and sweet and is easy to drink in the way that you could serve it to almost anyone and no one would find it too 'strong' to sip. I know someone who professes to love coffee but only drinks it so light it is lighter in color than a cup of tea! I think she would like this coffee. If you like a bold coffee, this is not for you. For my morning coffee I brew this blend at the smallest setting (6 oz.) and then it is just barely drinkable. But it's *not* a bad coffee. It's a very good coffee as long as you like your brew light roasted. This morning I went to the Costco website to view the coffee I was going to review and saw they DO offer a bold blend. But my local Costco did not have it to try (or I would have!!!!). 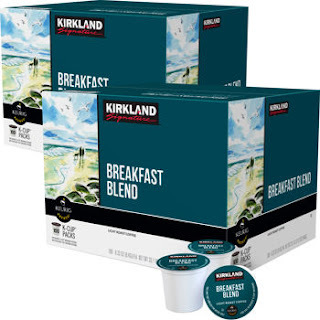 I also found Amazon carries the Kirkland Breakfast Blend K-Cups, 100 Count for about $5 less than Costco charges (current pricing for this morning).